Japan has protested to China over a newspaper article that called for a review of Japanese sovereignty over Okinawa. The article was published on Wednesday in the People's Daily - the mouthpiece of China's Communist Party. Citing treaties, it said now was a "suitable time to revisit the historically unresolved issue of the Ryukyu islands", as Okinawa is known. Okinawa is Japan's southern-most prefecture, comprising several islands. It is home to 1.4 million Japanese nationals and also hosts almost three-quarters of US military bases in Japan, including key airbases. The island chain used to be an independent kingdom, but was annexed to the Japanese state in the late 19th Century. The lengthy article in the People's Daily was written by two academics from China's top state-run think-tank. Citing treaties from the Sino-Japanese war and from World War II, it argued that ownership of the Ryukyu islands should be discussed. Chinese foreign ministry spokesman Hua Chunying then said in a regular press conference that the history of the island chain had "long called for attention in academia". Japan's top government spokesman, Chief Cabinet Secretary Yoshihide Suga, on Wednesday called the article "injudicious". He told a news conference on Thursday that Tokyo had told Beijing via diplomatic channels that it strongly protested if the article represented an official stance, Kyodo news agency reported. China said the article was written by the authors in their capacity as researchers, Mr Suga said. Japan and China are currently locked in a territorial dispute over islands that lie to the south of Okinawa, called Senkaku in Japan and Diaoyu in China. Japan controls the islands and sparked anger in China when it bought three of them from their private Japanese owner late last year. Since then Chinese government ships have been sailing in and out of what Japan says are its territorial waters, as Beijing presses its claim in an increasingly assertive manner. Japan says ownership of the uninhabited islands is not up for discussion, in a row which has seen ties chill significantly between the neighbours. 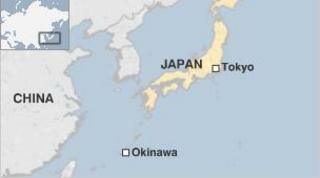 Some observers linked the comments on Okinawa to the war of words over the East China Sea islands. How serious are China-Japan tensions?